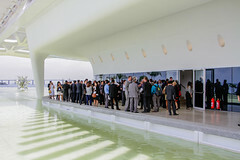 Around 400 people, between executives, government authorities and diplomats were gathered at Museu do Amanhã this Thursday, March 17, for the grand opening of Casa Rio, the most extensive business development program ever conducted in Brazil. 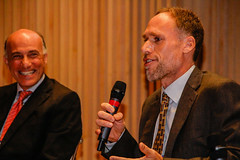 For four hours, companies sponsoring the 2016 Olympic Games, the Rio 2016 Committee and San Francisco City Hall discussed the impact of major sporting events in the long term goals of institutions and cities. 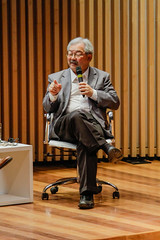 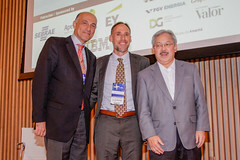 In the first panel, the mayor of San Francisco, Edwin Lee, city which has hosted the Super Bowl and the America’s Cup, pointed out that hotel tax revenue increased by 190%, as well as the legacy of a new cruise ship terminal, which has revitalized the region. 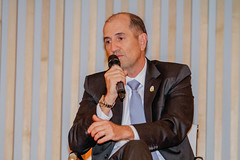 The CEO of the Games Organizing Committee, Sidney Levy, pointed out the growth of the hospitality sector and the work to qualify suppliers in Rio and Brazil in order to supply the Games. 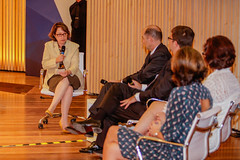 In the second panel, sponsoring companies, which deliver services and products to the Games’ operations, pointed out the opportunity for innovation that the event makes possible. 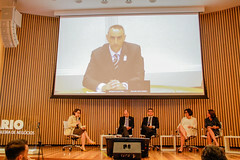 For Fernando Simões, executive director for Atos in Latin America, in addition to exposure for the brand, there is a gain in learning, in innovation and resilience, which perpetuates itself in the company. 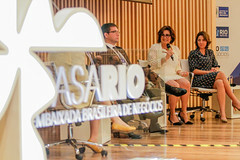 Paula Bellizia, CEO of Microsoft in Brazil, pointed out the never done before research work being done for the development of the Rio 2016 results portal, which is cloud based, and has its video components being developed in the city of Rio de Janeiro. 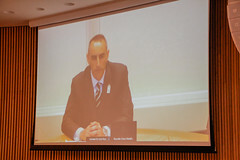 Christopher Katsuleres, Director of Olympic & Sport Marketing at GE, spoke from New York at the event through telepresence. 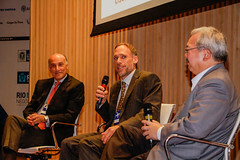 He pointed out the opportunity the company had to display the diversity of its operations when they became Olympic sponsors in Torino 2005. 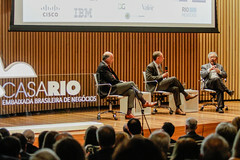 He remind that GE contributed with solutions for over 100 infrastructure projects in Rio de Janeiro during the Olympic cycle, citing the creation of the digital medical chart system for the athleates, making Rio the first Olympic city to have this kind of service. 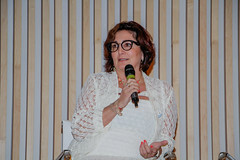 For Nina Lualdi, Senior Strategic Planning Director for Cisco, the Games are an incredible platform for developing business. 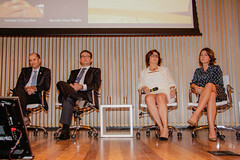 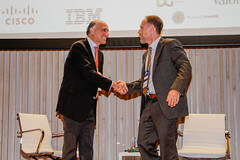 The executive pointed out the companies participation in the legacy works of network infrastructure at Porto Maravilha and the technological education project Naves do Conhecimento. 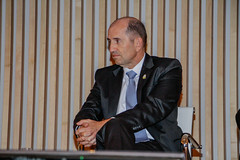 The president of EY Brazil, Jorge Menegassi, has around 500 professionals involved directly or indirectly with the 2016 Rio Games. 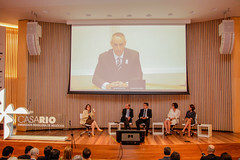 Reinforcing the power of brand exposure the Games have, Menegassi classified as considerable the increase in foreign interest in investing in Rio de Janeiro after the hand over from London. 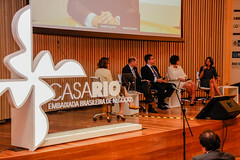 Casa Rio will have six months of activities, up until the end of the Paralympic Games, between conferences, business rounds and presentations on investment opportunities in the city, adding up to 40 events focused on attracting investments. 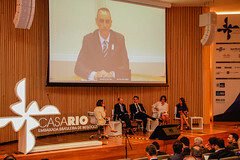 Marcelo Haddad, president of Rio Negócios, responsible for the Casa Rio program, celebrated the program’s grand opening. 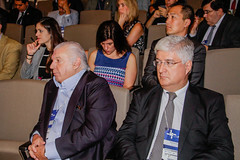 “We gathered here today major representatives of the production chain, from public policy formulators to academia, as well as national and international investors. 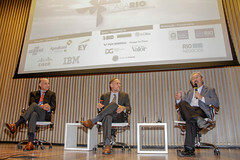 In six months, we intend on presenting the new business environment and opportunities in Rio de Janeiro for decision makers from companies not yet operating in the city and, with that, attracting up to 40 projects in the next two years”, concluded Marcelo. 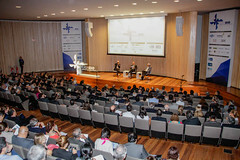 Cezar Vasquez, president of Sebrae-RJ, participated in the Grand Opening, along with David Barioni, president of Apex-Brasil. 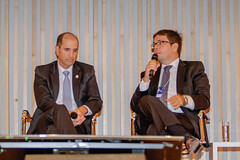 Cezar pointed out the Sebrae no Pódium program, which qualified suppliers for the 2016 Games. 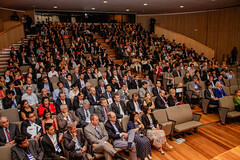 In his speech, Barioni reminded that the moment is ripe for promoting the integration between Brazilian and foreign companies and to show the world Brazil’s exporting potential. 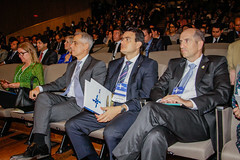 The focus of the conferences will be themes related to energy, hospitality, life sciences, infrastructure, technology, financial services and creative industry, areas in which there has been interest from investors who came to Rio in the past year. 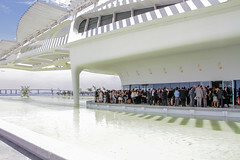 Casa Rio will have its conferences scheduled from March to September, at Museu do Amanhã.